About St. Petersburg. 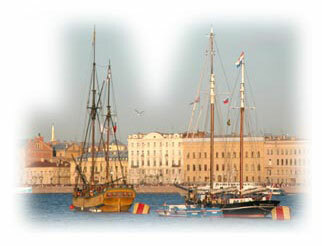 Tour to Saint Petersburg. Trip to Russia. Leningrad. The history of the St.Petersburg. Piterburg. Piters. Leningrad. Blokada. Alexander of Novgorod defeated the Swedes near the mouth of the Neva in 1240 - earning the title Nevsky (of the Neva). Sweden took control of the region in the 17th century and it was Peter the Great's desire to crush this rival and make Russia a European power that led to the founding of the city. At the start of the Great Northern War (1700-21) he captured the Swedish outposts on the Neva, and in 1703 he founded the Peter & Paul Fortress on the Neva a few kilometers inland. After Peter trounced the Swedes at Poltava in 1709, the city he named, in Dutch style, Sankt Pieter Burkh (after his patron saint) really began to grow. Canals were dug to drain the marshy south bank and in 1712 he made the place his capital, forcinggrumbling administrators, nobles and merchants to move to this northern outback and build new homes. Peasants were drafted as forced labor, many dying of disease and exhaustion; it's still known as the city built upon bones. Architects and artisans came from all over Europe. By Peter's death in 1725 his city had a population of 40,000 and 90% of Russia's foreign trade passed through it. The south bank around the Admiralty had become the city center. Peter's immediate successors moved the capital back to Moscow but Empress Anna Ivanovna (1730-40) returned it to St Petersburg. Between 1741 and 1825 under Empress Elizabeth, Catherine the Great and Alexander I it became a cosmopolitan city with a royal court of famed splendour. These monarchs commissioned great series of palaces, government buildings and churches, turning it into one of Europe's grandest capitals. The emancipation of the serfs in 1861 and industrializations, which peaked in the 1890s, brought a flood of poor workers into the city, leading to overcrowding, poor sanitation, epidemics and festering discontent. St Petersburg became a hotbed of strikes and political violence and was the hub of the 1905 revolution, sparked by 'Bloody Sunday' on 9 January 1905, when a strikers' march to petition the tsar in the Winter Palace was fired on by troops. By 1914, when in a wave of patriotism at the start of WWI the city's name was changed to the Russian-style Petrograd, it had 2.1 million people. Palace alongside the country's reformist Provisional Government. It was to Petrograd's Finland Station that Lenin traveled in April to organize the Bolshevik Party. The actual revolution came after Bolsheviks occupied key positions in Petrograd on 24 October. The next day, the All-Russian Congress of Soviets, meeting in the Smolny, appointed a Bolshevik government. That night, after some exchanges of gunfire and a blank shot from the cruiser Aurora on the Neva, the Provisional Government in the Winter Palace surrendered to the Bolsheviks. War caused Petrograd's population to drop to about 700,000, and in 1921 strikes in the city and a bloodily suppressed revolt by the sailors of nearby Kronstadt helped to bring about Lenin's more liberal New Economic Policy. Petrograd was renamed Leningrad after Lenin's death in 1924. It was a hub of Stalin's 1930s industrialization program and by 1939 had 3.1 million people and 11% of Soviet industrial output. When the Germans attacked the USSR in June 1941 it took them only 2,5 months to reach Leningrad. As the birthplace of Bolshevism, Hitler swore to wipe it from the face of the earth, but not before his expected New Year's victory ball in Hotel Astoria. His troops besieged the city from 8 September 1941 until 27 January 1944. Many people were evacuated. Nevertheless, approximately one million died from shelling, starvation and disease in what's called the '900 Days' (actually 872). By comparison, the USA and UK suffered about 700,000 dead between them in all of WWII. The city was saved from an even worse fate by the winter 'Road of Life' across frozen Lake Ladoga to the east, a thin supply line which remained in Soviet hands. After the war, Leningrad was reconstructed and reborn, though it took until 1960 for its population to exceed pre-WWII levels. The city center retains its aura of past glory and current chic, a heady mix of opulence and decay, though the outlying areas are lined with depressing, uniformly gray and chunky blocks of flats that go on forever. In 1989, Anatoly Sobchak, a reform-minded candidate, was elected mayor. Almost as soon as Dzerzhinsky's statue hit the asphalt in Moscow, the Leningrad city council voted to change the city's name back to St Petersburg (though the region around the city refused to join in the fun and to this day calls itself the Leningradskaya oblast). Sobchak's rule oversaw the 1994 Goodwill Games, which were quietly dubbed a bit of a mess, but which gave the city a needed shot in the arm and millions of roubles worth of needed cosmetic repairs to the city center (Nevsky prospekt's fine buildings haven't looked this good since the city's heyday at the end of the 19th century). Despite a new reputation as the crime center of Russia, mainly due to several high-profile contract killings, St Petersburg is now a tourist-friendly, cosmopolitan city with a thriving cultural and artistic core. In notable contrast to Moscow's in-fighting, dirty politics and entrenched lobbyist subculture, St Petersburg has been able to capitalize on the injection of foreign interest in Russia and business is booming. Overused as the term may be, St Petersburg has, in fact, re-established itself as Russia's window on the West.